Air compressors are generally positive displacement units and are either of the reciprocating piston type or the rotary screw or rotary vane types. The air compressor used here is a typically small sized, two-stage compressor unit. It also consists of a compressed air tank, electric rotor and pulley drive, pressure controls and instruments for quick hook up and use. The compressor is driver by a 10HP motor and designed to operate in 145 – 175 PSI range. If the pressure exceeds the designed pressure of the receiver a release value provided releases the excesses air and thus stays a head of any hazards to take place. The stored air from compressor is passed through an air fitter where the compressed air is filtered from the fine dust particles. However, before the suction of air into compressor a filter process take place, but not sufficient to operate in the circuit here the filter is used. Then having a pressure regulator where the desired pressure to the operated is set. Here a variable pressure regulator is adopted. Through a variety of direction control value are available, a hand operated solenoid Valve with control unit is applied. The solenoid valve used here is 5 ports, 3 positions. There are two exhaust ports, two outlet ports and one inlet port. In two extreme positions only the directions can be changed while the Centro ore is a neutral position and no physical changes are incurred.The 2 outlet ports are connected to an actuator (Cylinder). The pneumatic activates is a double acting, single rod cylinder. The cylinder output is coupled to further purpose. The piston end has an air horning effect to prevent sudden thrust at extreme ends. The compressed air from the compressor reaches the solenoid valve. The solenoid valve changes the direction of flow according to the signals from the timing device. The compressed air pass through the solenoid valve and it is admitted into the front end of the cylinder block. The air pushes the piston for the grinding stroke. At the end of the grinding stroke air from the solenoid valve reaches the rear end of the cylinder block. The pressure remains the same but the area is less due to the presence of piston rod. This exerts greater pressure on the piston, pushing it at a faster rate thus enabling faster return stroke. The weight attached at the end of the hacksaw frame gives constant loads which lower the hacksaw to enable continuous grinding of the work. The stroke length of the piston can be changed by making suitable adjustment in the timer. Grinding hacksaw frame is removed in the case of grinding operation. The above same procedure is occurring in the grinding operation. There is no need of giving feed during every cut due to the presence of weight. 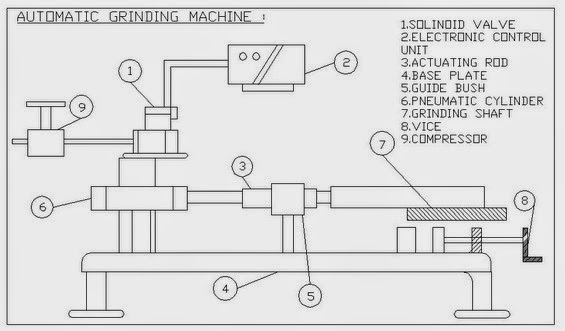 The grinding/grinding speed can be varied according to our needs by adjusting the timer. It does not have any Prime mover, like electric motor related to the unit. As the air is freely available, we can utilize the air to cut the metal and hence it is economical. Less efficiency when compressed to mechanical device.